Tina and Trina Fletcher are twin sisters who are trailblazing the education policy sector and changing lives while they're at it. The Fletcher sisters are authors, consultants and motivational speakers motivated to inspire and dedicated to serve. Born and raised in rural Arkansas, the Fletcher sisters have always been determined to positively impact the lives of others, especially youth, women and girls. The Fletcher sisters have spoken at K-12 schools, colleges and universities, businesses, faith and non-profit organizations across the country and globe with the goal of empowering youth and young adults through education, leadership development and their personal story of success. The Fletcher sisters are the Founders of Dream Girls DMV and ARK, an organization focused on the holistic development of women and girls here in the United States and in Africa. The Fletcher sisters have been named IMPACT Leaders of the Month and Top 30 Under 30 by 93.9 WKYS. They are the authors of 10 Steps to Succeeding at ANY College and Surviving High School: A Teen's Guide to Academic and Social Success. We spoke with the Fletcher sisters about their motivations and commitment to education. Read the interview below for an inspirational conversation around the vitality of education and access for black youth. Transcription edited for clarity purposes. Blavity: Will you tell us more about your upbringing and how that influenced your career paths? Tina: The town that we lived in has just over 850 people. The school in our little town was consolidated so we were actually bussed to the next town over to go to school. We took education very seriously because we are first-generation college students. Our great grandmother had ten children and each of those ten children on average had about three kids, so we come from a very large family. We were the first to go to college since our great uncle in the '70s. We knew we wanted to take advantage of every academic opportunity that came our way because we knew we were setting the stage for everyone that came after us in our family. That's why we are so passionate. Trina is working on her PhD which will be her fourth degree, I have two degrees, and now we see our cousins going to school and choosing to become educated. They see us as role models and look up to us, and we know education is the reason why we were able to do that. So now we are looking to do more work in education because we know that's the answer for a lot of kids who feel like they don’t have the same options to do great things. We know education is the key to so many opportunities. Trina: I would just add that another key thing is that my mom, being a single parent, she was 8-9 months pregnant with us on her 21st birthday. You're talking about someone who didn't have a lot of support from her family, and when she couldn't get the help she needed with us that made her do whatever it took to make sure we were successful. So even though there were days where she couldn't help us with our homework or she couldn't put us in a tutoring program, she instilled in us to make sure we were going out to get whatever help we needed to get to ensure that we could be successful academically, because she knew that college was the only way we were going to get out of Arkansas. We knew education was extremely important. B: Tell us more about your organization, Dream Girls ARK and DMV. What I love about the mission is that it's rooted in a holistic approach, tell us more about why that approach was necessary. Tina: When I was teaching at Anacostia High School, which is the lowest performing high school in Washington D.C., I noticed that as summer approached, a lot of my students didn’t have plans for the summer. No one went to summer camp and no one want on vacation. This was the case for weekends throughout the school year also. I was coaching the cheerleading squad and I had a close relationship with a lot of the female students. Trina and I said why don’t we just take a lot of the girls to a WNBA game? We have a WNBA team here in the city, yet our kids never get to go to games. So we fundraised and pulled together our friends and colleagues and said "Hey, we are going to take these 50 students aged 3 – 18 to this game, can you come with us and chaperone?" The turnout was great, so we ended up hosting two events that summer. At the end of the summer the parents asked to us to please make it a real thing, because their daughters loved the experience and there was nothing else like it in the city. And so Trina and I ended up finding a great partner in Cora Masters Barry, who is the former first lady of the city, and she allowed us to use the Southeast Tennis and Learning Center to launch our mentoring program. The reason why we wanted to focus on a holistic approach was because we knew it was more than just homework, fitness and mentorship, it was all of this. So we knew that if the girls attended every other Saturday and we didn’t feed them, mentor them, tutor them and allow them to know that it’s okay to exercise, they wouldn't benefit wholly from the program. We knew that our girls had to be exposed two times over. So we created this system in which they were getting all of these things every time they were with us. 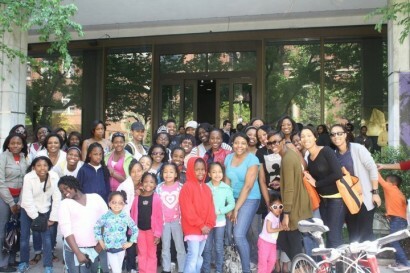 Some mentoring programs focus on one thing, but we knew our girls needed all of the above. There were girls who were 5 years old, and now they’re in middle school running for student government. We are able to see the work we put into these young ladies, and even our mentors — some of them now are attorneys, and we have to believe that something we did or said impacted their lives. Trina: In addition to Dream Girls, we began taking on a number of Women’s History Month speaking engagements. I remember having a conversation with students at universities, just talking about women’s empowerment and being able to lean on each other and treat each other with respect in order to be successful in our personal and professional lives, and that’s something we’re very happy that we’ve been able to do. Tina: Trina and I have been to Senegal training and mentoring women who don’t even speak the same language as us, yet we realized quickly their issues are the same as ours. The messages we share with American girls and women equally resonates with the women and girls we've worked with in East Africa. We have to learn to lean on and trust one another, learning to love each other is really important. Tina and Trina in Dakar, Senegal for the Youth Women's Empowerment Summit. B: I couldn't help but notice that both of you hold positions that put you at the policy-making table. Tell us more about why representation in Education Policy is so important. Trina: I’m finishing my PhD and I had no intention taking a full time job before finishing, and this amazing opportunity came up to be the K-12 director of NSBE, one of the largest student-run organizations in the country, and one of the largest minority-run non-profit organizations focusing around K-12 and higher education and policy. I often say that I don’t care if young students are going into engineering or not, my top priority is to see them be able to do something with it. I want to see more kids graduating from junior high and high school and going on to college. When I look at the work that I do, with NSBE and with our consulting company, education is the real answer. If you look at the amount of jobs that are being created, the jobs coming down the pipeline with the highest pay, if our children don’t know about these opportunities or know that they don’t have to go to a major university to succeed, they’re not going to pursue it. So we’re going to see jobs being created, cities grow and gentrify, and we’re not even at the table. It doesn’t make sense when the population for people of color is growing the way that it is, yet our kids are not being exposed to the education that they need to be prepared for those jobs. That is a major issue for our country and we don’t talk about it enough. Even in my position having all the control and power I have, there’s still a lot of red tape. So Tina and I decided to start our own consulting company to work directly with school districts, community leaders, major nonprofits, to be able to move the needle even more because there’s so much work that needs to be done. Tina: I totally agree, Trina is very K-12 focused, as for me as a former high school teacher, I’ve had two former students killed in D.C. and so for me, I look at the impact of inequity in education and how it impacts entire families and our communities. How is our current K-12 education system negatively impacting our communities? We’re graduating students who are not prepared to do anything after high school. I think about how we have to fix education today in order to prevent issues that are coming down the pipeline in the next 10-20 years. We know that education is one of those avenues where we can help strengthen families and communities. Trina: One of the underlying focuses for us is that we want to be proactive. We want to get underneath issues before major problems can happen. Making sure students in our communities know what opportunities are out there, to having conversations with local community leaders to better understand challenges young people and families are dealing with. So Tina spends a lot of time, as a current elected official in the D.C. area, helping people come together and work in solidarity in order to prevent a lot of the issues we are seeing. That goes back to having this mindset of being proactive. How can we get underneath these issues prior to them instead of being reactive? I do believe fully that there’s more that we can do to be proactive. Tina: We see ourselves as the middle person, bringing people to the table to have serious conversations saying what are our options, what are our solutions, and how do we do this together? Because yelling at two sides of the room doesn’t get us to a centralized solution for the entire community. B: How do you fight apathy in the work that you do? Tina: I was working with the Mayor of D.C. and I was the Director of Community Engagement for a newly-appointed Deputy Mayor working with underserved communities. The Mayor literally said, "I’m going to create a position for the poorest underserved communities in the city." My job was to go out to the most troubled neighborhoods every day. So I was in public housing every week hosting job fairs, hosting roundtable discussions with single mothers, I mean everything you can think of. We were attempting to be innovative and creative, because this work had never been done. Living in a neighborhood that is going through a 100 percent increase in homicides and doing this work every day, it was very taxing. There were days when I wanted to pack my bags and move back to Arkansas. Because I’d rather live on a dirt road and not have to hear sirens than to wake up every day trying to fix a problem that seems like there is no solution, but I decided that running wasn't the answer and that taking it one day at a time would help me focus on what needed to be done. I will say Trina and I use travel to stay motivated, I know that is not an option for everyone, but it is so important to get out of the area you’re from to miss it, and to miss your job. That might be every other weekend, take a trip somewhere, because the pain of the work will take over, but it’s also important for you to remember that the work you’re doing is so important. When I was able to help a returning citizen get a job, I just felt like I won the lottery, because I did the inevitable. That is my advice, make sure you find time to pull yourself away from the work so you can give yourself completely to the work when you’re in it. Trina: Try to find a way to get on a project where you can see your value added. Whether it is at the end of the day or at the end of the week, you can see where you’re making a difference. One thing that I’m very fortunate to have are effective program evaluations, so I can see how my students are doing after they participate in our program. Even with Dream Girls, even though we knew about all of the issues and challenges, we implemented pre-program and post-program surveys to gauge if we were having an impact. And one thing we made sure to do with our consulting company is that we won’t work on a project or do a speaking engagement without knowing what our impact was, what we did well, what we need to improve on in order to move the needle. So when things aren't perfect, we’re able to learn from it. Regarding self-care, it is so important to have people around you to remind you of why you’re doing what you’re doing, but also people who will help you stay grounded and true to who you are and remind you that you’re human just like everyone else. It’s okay to not be super engaged all the time and just take care of your mind, body and soul. Even though we are in a world where social media and technology are ingrained in our culture, it’s okay to take a step back. B: Tell us about some of the challenges you went through while starting your own consulting firm. What advice do you have for young entrepreneurs? Trina: My advice is do not allow fear to get in the way of you following your dreams. Don’t be afraid to ask for help, network with your mentors, relationships are so important. Money and fear were both major challenges for us. Fear still gets to us. I would encourage people to be fearless, work hard, connect with people and don’t be afraid to ask for help. I would challenge young people to push forward. Tina: We were lucky. We got into doing this because there was a yearly conference I attended each year while in undergrad. One year, I asked Trina if she would mind going to the conference as workshop hosts. She agreed and so we were first-year graduate students presenting workshops at the SBSLC conference. From there, people started inviting us to their college. It was strange because we were 23 years old going to colleges and speaking to 21-year-olds about resume building. We just kept going and stayed ambitious. We were fearless. As young black professionals and women of color, as we started climbing the ladder in our professional positions, we faced challenges that made us question our ability and skills because of what’s going on at work. On the side, we are our own bosses — we're doing great and making our own money, so why are we allowing these people in our professional jobs to make us feel less than adequate? This is such a huge conversation that we need to have with young professionals. One piece of advice, whatever your goal is, is to prepare properly while you’re in college. A lot of young people unintentionally ruin their chances of becoming financially independent because of financial decisions they make in college. There are people leaving undergrad with $50-60 thousand in undergrad debt. Much of which they didn’t need. A lot of debt prevents you from being able to quit your job. Fear will stop you from doing everything. You can’t have fear but you have to properly prepare. Set yourself up for success. Start investing in yourself. Properly prepare as early as possible so you can have the life you want.